So Mom went to that Natural Foods Expo yesterday and I’m eyeing the new treats she brought home – boy, am I lucky. Lots of fun smells, and the first one she let me taste was a product by Bench & Field called Holistic Natural Canine Treats. They only have 7 ingredients are are high in protein. All ingredients are real foods even I can recognize with no preservatives. 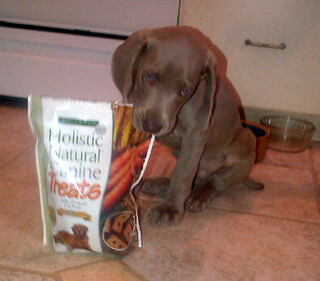 The nice man named Mark at the show gave Mom a big bag for me to try – I’m so excited for my new treats!